Hospice Social Workers - What Are They & What Do They Do? What Is a Hospice Social Worker? A hospice social worker is an essential member of the hospice team. The team is composed of your family physician and/or specialist, plus a hospice physician, nurse, social worker, spiritual support counselor, home health aide, volunteer, and other practitioners, if necessary. Together, the team addresses the physical, emotional, and spiritual needs of you and your family. Hospice social workers are trained, licensed professionals who help both patients and families address many types of social, emotional, and practical challenges near the end of life. Patients and families in these situations are under great stress and require a skilled social worker to help process and address their complex and inter-related needs. Indeed, the changes and pressures that accompany terminal illness can magnify family tensions, and triggering new difficulties. Hospice social workers have specialized expertise in these issues and are able to help you adjust, cope and plan for the journey ahead. These caring, dedicated providers enhance the social functioning and overall well-being of hospice patients and their families. They assess, educate, advocate for and directly assist those they serve. Hospice social workers provide a wide range of supports, based on the specific needs of you and your family. A hospice social worker explains what hospice care is and the role of the hospice team. They help you navigate the healthcare system, as necessary. They help you and your family understand your care options as they relate to your goals and life circumstances. They can help identify other services you need and work with you to help you connect with those services. 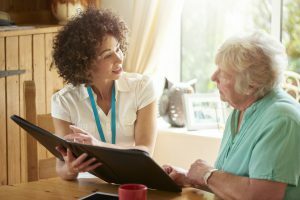 A hospice social worker identifies community services that address your needs and helps connect you to them. For example, they can make a referral for Meals on Wheels, help connect you to a home visiting physician service, guide you in getting additional home care, , or link you to the VA and other benefits. 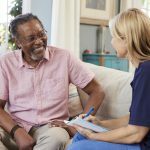 A hospice social worker also guides you in applying for financial assistance or resources, such as Medicaid, temporary assistance programs for energy or utilities, or county assistance programs. They work to help you understand your goals for your life and help support you in reaching those goals with planning. Social workers can help you complete a living will and other advance directives. They help you understand the differences between wills and powers of attorney. Hospice social workers also help you or your family member decide what environment is best for your loved one to receive care. They can assist in a transition from a rehabilitation center assisted living facility or nursing home back to your home, or vice versa. Hospice social workers treat the patient and family caregivers as a unit. Using this approach, they provide counseling and support, coordinate community resources, address insurance questions, and help with advance planning, among other personalized services. Social workers are expert counselors. 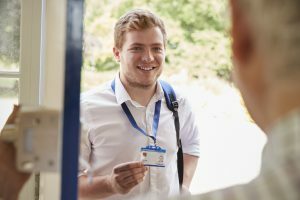 They are here to listen, to help you process information and experiences, help you to problem solve and cope in the best way possible.A hospice social worker ensures you have access to the resources that will make you and your family as comfortable as possible. They help you address you and your loved one’s emotional needs through counseling and other support. They explain the effects of disease and illness on your family’s mental and emotional health. If you or your loved one is a veteran, they honor your service by making connections to the VA, acquiring personal military information and experiences, obtaining medals, and coordinating a veterans ceremony to recognize your dedication to our country. Hospice social workers help with family dynamics, assess situations, strengths, and your support network. They help you adjust to the changes and challenges in your life related to you or your loved one’s illness and end of life. Samaritan’s hospice social workers consider each patient’s ethnic, cultural and religious background, as they provide care and support. A hospice social worker talks to you or your loved one about fatigue and burnout when caring for a loved one. They offer tips to help you to continue to care for your loved one and yourself. They help you plan for time of death and the funeral. And connect you with the people and organizations you need to inform about your loved one’s passing. They provide age-appropriate education and emotional support for your children and grandchildren, including activities that allow them to express their feelings. A hospice social worker provides counseling for family members who are dealing your diagnosis and the feelings surrounding death. The hospice social worker counsels you through your grief journey. 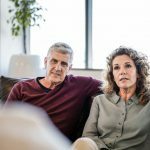 They can help you to understand what grief is and help you work through your own grief response. Social workers can do this through a personal support counseling session or offering coping tips to ease day-to-day emotions. Hospice social workers lead support groups and provide individual, couples, and family counseling. They also provide in-service training to other professionals involved in patient care on topics like Compassion Fatigue, End-of-Life Decision Making and Planning, and Coping with Grief. What will my hospice social worker do for me and my family? Your hospice social worker will help you and your family cope with the social, emotional, and practical challenges related to your illness. Depending on your situation, your social worker can provide counseling, help you access community resources, assist you in problem solving, setting goals and decision making. They can offer emotional comfort and grief support to family members. I have young children and I’m concerned about the impact of my illness on them. Can a hospice social worker help? Yes. A hospice social worker is trained to work with children and adults of all ages to help them cope with illness and loss. Your hospice social worker can offer age-appropriate information, resources and counseling for your children that will help them process their feelings in healthy ways. They can also support parents/family members in how to talk with their children about illness, hospice and death and guide them in ways they can comfort and support the children in their lives. I’m worried about how my spouse and other relatives are handling my illness. What can a hospice social worker do? A hospice social worker can help your close relatives cope with illness and loss. Your social worker can provide counseling, and assist in many other ways. For instance, the social worker can help identify needed resources, educate your family about your care, and assist your spouse in finding support for his or her own needs. I’m struggling with depression as I face my mortality. Can a hospice social worker help me? Yes. A hospice social worker can help you address depression and other mental-health issues, to ensure you have the best possible quality of life through your remaining days. Your social worker can provide counseling, so you can discuss your feelings and concerns, goals and priorities. He or she can coordinate with your hospice nurse to address any needs for medication. Even as the end of life approaches, you are still here — and your social worker can help you focus on living and making the most of each day. Please note: If you or someone you know is considering suicide, get help immediately. The National Suicide Prevention Lifeline provides 24/7, free, confidential support and crisis resources at 1-800-273-8255. How will my hospice social worker determine my specific needs and those of my family? Your hospice social worker will conduct an initial assessment to determine yours and your family’s needs. This will identify your social, emotional, and physical needs, and will consider your family’s dynamics, resources, strengths and challenges. The assessment will also consider your ethnic, cultural, and religious background. This evaluation will enable the social worker to develop specific recommendations, which will allow the hospice team to quickly and accurately provide effective assistance to you and your family. How can a hospice social worker help prepare me and my family for my death? Your hospice social worker can provide an array of supports to help you and your family prepare for your eventual death. For instance, your social worker can help identify what’s most important to you, so you can spend your remaining time focusing on the people and activities that are most meaningful. Your social worker can help you leave legacies to family members, including letters, videos, or scrapbooks. They can help you complete advance directives, and assist you in putting your final affairs in order. They can provide information so you and your family know what to expect as your illness progresses. They can help your caregivers develop a plan for the time of death. And they can help with funeral arrangements and provide grief support. If you have any questions about your hospice social worker, please call us at (800) 229-8183 or fill out this online form.